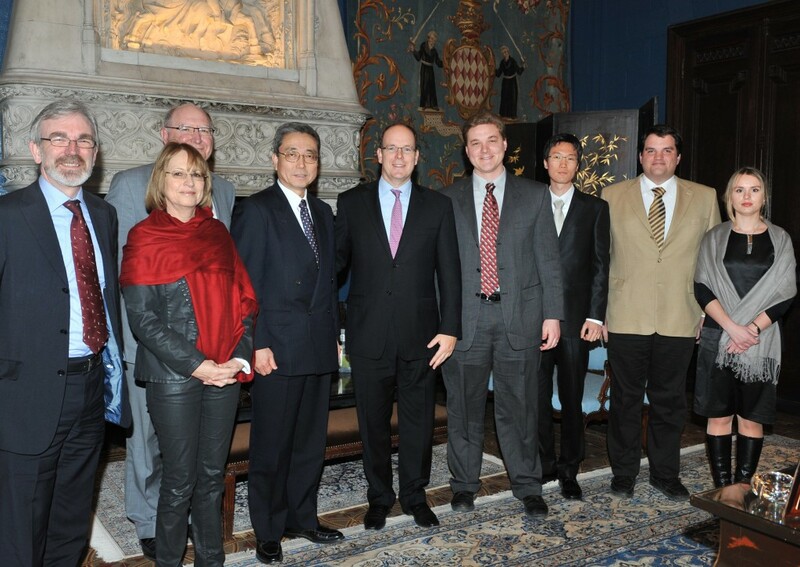 Left to right: David Campbell; Pascal Amenc-Antoni; Neil Calder; Kaname Ikeda, ITER Director-General; HSH Prince Albert II; Matthew Jewell; Junghee Kim; Axel Winter; and Sophie Carpentier. On 11 February, HSH Prince Albert II personally congratulated the first ITER Monaco Postdoctoral Fellows funded by the Principality of Monaco at a lunch hosted by the Prince in the Palais Princier. The Fellows were chosen from the 28 applicants from the ITER Members and have started work at the ITER Organization in Cadarache. Sophie Carpentier, from France, who will work on plasma-wall interaction physics; American Matthew Jewell will work on superconducting magnets; Junghee Kim, from Korea, will work on plasma diagnostics; Russian Evgeny Veschev, will work on energetic particle physics and Axel Winter, from Germany will work on plasma control. Axel Winter expressed his excitement at working for one of the biggest scientific projects currently under construction in the world. "For me working for ITER is a real challenge. The combination of research in physics and engineering work in an international environment convinced me to apply for the Monaco Fellowship. Coming from a different field of physics, the fellowship will offer me the possibility to gain experience in fusion research and together with my background in accelerator physics to contribute to the success of ITER." ITER Director-General Kaname Ikeda commented: "The Partnership Arrangement with the Principality of Monaco has allowed us to start developing an important aspect of the ITER Project—the training of the next generation of fusion scientists and engineers. We have been fortunate to attract a very talented group of applicants from across the ITER Members' communities." The Partnership Arrangement set up these five Postdoctoral Fellowships together with the establishment of an annual conference on ITER related research was signed in January 2008. The Principality contributes EUR 400,000 for five Fellowships every two years over a ten year period, enabling five young scientists from the seven ITER Member countries or from the Principality of Monaco to be trained over two years in research areas related to the ITER Project. David Campbell, a senior scientist in the ITER Organization who was involved in the selection process said: "It has been a great pleasure interacting with these young people during the selection procedure and appreciating the inspiration they derive from ITER's goal of demonstrating the scientific and technological feasibility of fusion energy."